This is a collection of English translations of Nazi propaganda material by Joseph Goebbels, part of a larger site on Nazi and East German propaganda. It includes many of his weekly articles for Das Reich, as well as a range of his speeches. 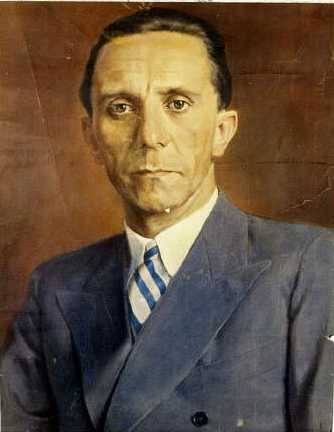 Some of Goebbels’s pre-1933 articles and speeches are available on the pre-1933 section of the German Propaganda Archive. The portrait was done by Wilhelm Otto Pitthan. For further information on the German Propaganda Archive, see the FAQ. “Dr. Goebbels and his Ministry”: A 1934 article by Hans Fritzsche. Pictures of Goebbels speaking in 1935. “On the Art of Speaking to the World”: An introduction by an aide to Goebbels’ book Die Zeit ohne Beispiel. It presents the Propaganda Minister in a flattering light. 31 December 1933: Goebbels looks back on Nazismâ€™s first year. 31 December 1938: Goebbels reviews 1938 and complains about complainers. 31 December 1939: Goebbels reviews 1939, and finds Germany innocent. 31 December 1943: Despite the disasters of 1942, Goebbels predicts German victory. 31 December 1944: The end is in sight, but Goebbels is not willing to admit it. (1934): No speech on Hitler. Instead, Goebbels delivered a speech on the press. “Our Hitler” (1937): Available in Landmark Speeches of National Socialism. “German Women”: Nazi views of women (March 1933). “Radio as the Eighth Great Power”: On radio (18 August 1933). “The Racial Question and World Propaganda”: Goebbels at the 1933 Nuremberg Rally. Goebbels on Propaganda: His speech at the 1934 Nuremberg Rally. Available in Landmark Speeches of National Socialism. “Communism with the Mask Off”: His1935 Nuremberg Rally Speech. “The Coming Europe”: The Czechs must get used to German occupation (11 September 1940). “Youth and the War”: The German youth are fortunate... (29 September 1940). “Christmas, 1941”: Goebbels says Germans have a lot to be thankful for (24 December 1941). Total War: The printed version of Goebbelsâ€™s most famous speech (18 February 1943). Total War: The spoken version. Available in Landmark Speeches of National Socialism. “The Winter Crisis is Over”: Goebbels remains confident of German victory (5 June 1943). “In the Front Ranks”: A memorial meeting for the victims of Allied bombing raids (18 June 1943). “Immortal German Culture”: Opening a wartime art exhibition (26 June 1943). â€œThe Festival of Strong Heartsâ€�: Goebbelsâ€™s last Christmas Eve address (24 December 1944). “More Morality, Less Moralism”: Goebbels wants freedom in the private sphere (27 January 1934). The Battle of the Pharus Hall: A 1927 battle in Berlin. Adolf Hitler as a speaker: Goebbels praises his master. “What Does America Really Want?”: Goebbels is unhappy with the USA (21 January 1939). “The Coffee Drinkers”: An attack on those who are dissatisfied (11 March 1939). “Great Days”: Goebbels on the end of Czechoslovakia (18 March 1939). “The Morals of the Rich”: Britain has no right to complain about Germany (25 March 1939). “Children with their Hands Chopped Off”: On British propaganda (24 June 1939). “Englandâ€™s Guilt”: Goebbels explains the reasons for World War II (Fall, 1939). “Missed Opportunities”: On the invasion of France (2 June 1940). “Churchillâ€™s Lie Factory”: Churchill, it seems, is guilty of the “big lie.” (12 January 1941). “Winston Churchill”: On Winston Churchill (2 February 1941). “The Veil Falls”: The invasion of the Soviet Union had just begin (6 July 1941). “Mimicry”: An attack on the Jews (20 July 1941). “The Door to a New Era”: On foreign press criticism (28 September 1941). “The Matter of the Plague”: Why Germans may not listen to the BBC (5 October 1941). “When or How?”: Goebbels on the war situation (9 November 1941). “The Jews are Guilty”: An attack on the Jews (16 November 1941). “The Pompous Giant”: Why England will lose the war (23 November 1941). “Roosevelt Cross-examined”: Goebbels on FDR (30 November 1941). “A Different World”: The war after Pearl Harbor (21 December 1941). “What is Sacrifice”: Encouraging the home front during a hard winter (28 December 1941). “The New Year”: On the outlook for 1942 (4 January 1942). “The Good Companion”: On German radio policy (1 March 1942). “Churchillâ€™s Trick”: Goebbels is happy with Winston Churchill (1 March 1942). “A Word to All”: Encouraging courtesy (8 March 1942). “An Open Discussion”: Why food rations are being cut (29 March 1942). “The Paper War”: On bureaucracy and complaining during war (12 April 1942). “Heroes and Film Heroes”: Germans are better heroes than Americans (7 June 1942). “The Air War and the War of Nerves”: On British night bombing of Germany (14 June 1942). “The Tonnage War”: Goebbels on the U-boats (21 June 1942). “The So-called Russian Soul”: The Russian soul is of inferior quality (19 July 1942). “Godâ€™s Country”: An unflattering portrait of the USA (9 August 1942). “Don’t Be Too Fair”: Germans must be taught to hate (6 September 1942). “What is at Stake”: Encouraging determination to win the war (27 September 1942). “The Optics of War”: Preparing the public for Stalingrad (24 January 1943). “The European Crisis”: An anti-Semitic article (28 February 1943). â€œWhere Do We Stand?â€�: Not reprinted in a later book of Goebbelsâ€™s work (2 May 1943). â€œDriving Forcesâ€�: The Jews are trying to fool the world (6 June 1943). “Morale as a Decisive Factor in War”: Germany deserves to win (7 August 1943). “The Realities of War”: The war situation is favorable for Germany (22 August 1943). “A Classic Example”: The fall of Mussolini (19 September 1943). “30 Articles of War for the German People”: Support the war effort (26 September 1943). “The New Year”: An optimistic look to the future (2 January 1944). “The Battle of Berlin”: Goebbels discusses Allied bombing (13 February 1944). “Why Are Things So Difficult for Us?”: Germanyâ€™s difficult situation (9 April 1944) . “Life Goes On”: On Allied bombing, with a hint of the V-weapons (16 April 1944). â€œA Word about Enemy Air Terrorâ€�: Lynch captured Allied airmen (27 May 1944). “The Background of the Invasion”: A commentary on D-Day (18 June 1944). “The Question of Revenge”: The V-1 rocket bomb (23 July 1944). “The Call of Duty”: After the 20 July 1944 assassination attempt on Hitler (6 August 1944). “The Higher Law”: Germany will win because it is morally superior (24 September 1944). “The World Crisis”: The other side has it just as bad (17 December 1944). “The Creator of the Worldâ€™s Misfortunes”: The last major anti-Semitic essay (21 January 1945). â€œA People on the Defensiveâ€�: Motivating Germans in the face of disaster (11 February 1945). “Our Chance”: Goebbels argues that Germany can still win the war (18 February 1945). “The Year 2000”: What will happen after Germany wins the war (25 February 1945). â€œLook Confidently to the Helmsmanâ€�: Empty words of hope (4 March 1945). “History as a Teacher”: Goebbels resorts to historical parallels (1 April 1945). “Fighters for the Eternal Reich”: The Allies are near collapse, Goebbels says (8 April 1945). “Risking One’s Own Life”: Goebbels is worried about Germans who surrender (15 April 1945). “Resistance at Any Price”: Goebbels’s final published article (22 April 1945).